Our manicures focus on your hands with nail shaping with cuticle work. Finished off with a warm hot towel and hand lotion massage on your hands. Polish of your choice will applied on nails. Soak your feet in a warm, calming whirlpool, followed by gentle nail and cuticle work, along with heel work. Ending Process includes cooling Exfoliation gel to relax your legs and feet with a hot towel, free hot stone massage and lotion. Finished up with the polish color of your choice. Treat your feet with a spa pedicure, along with nails shaping, cuticle and heel work. A mint mask or paraffin wax is applied with our hot stone massage. Your choice of polish is applied at the end of the pedicure process. A mint mask cools and relaxes the skin while paraffin is softens, warms and relaxes the skin to improve circulation. Our Spa Pedicure is combined with stress relieving reflexology massage techniques, in other words the ultimate pedicure. CND Vinylux polish gives a week of perfection without a base coat. This polish dries naturally to a flawless finish and strengthens its resistance to chips over time. Vinylux 7 Day Polish is put on after a full manicure. CND Vinylux polish gives a week of perfection without a base coat. This polish dries naturally to a flawless finish and strengthens its resistance to chips over time. Polish is to put on after the pedicure process. Chips and smudges are the thing of the past. Gel polish lasts up to 2-3 weeks. Gel color is applied on after clean up relaxing manicure process is done. Stop stressing over chips and smudges for your nails. This color gel last up to 2-3 weeks and will take only two minutes to dry. Gel-polish is applied on after a hot, warm relaxing feet soaking with the clean up process of our pedicure. 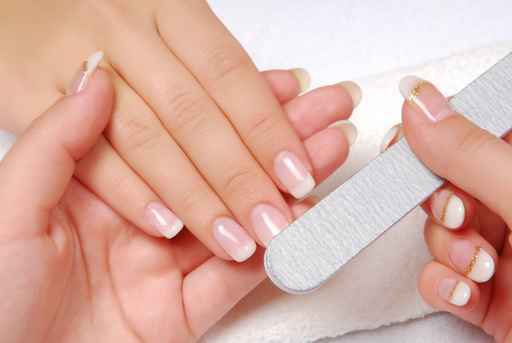 Manicure and pedicure nail treatments focus on your cuticle and nails shaping on your hands and feet. Finish offed with a hot towel and lotion massage. Nail color polish applied with your choice. A foot soak is followed by gentle nail and cuticle work, along with exfoliation, Hot Towel and massage. Regular nail polish is apply on toenails after a full pedicure and gel color polish is put on after a clean up manicure process is done. Gel color last up to 2-3 weeks wear. A whirlpool foot soak is followed by gentle nail and cuticle work, along with exfoliation, Hot Towel and massage. Gel nail polish is applied on toes nails. Gel color last up 2-3 weeks wear. Regular polish put on after a clean up manicure process is done. A whirlpool foot soak is followed by gentle nail and cuticle work, along with exfoliation, Hot Towel and massage. Gel nail polish is apply on toenails. Gel color last up 2-3 weeks. Gel nail polish is put on after the clean up manicure process is done. Remove old polish and fingernails are buffered and filed if needed for a neat look of desire with a new polish on. Our priority is to provide the safest and cleanest environment to each of clients. We sterilize tools in a Dry heat sterilizer up to 450 degree for 30 minutes, which is the same machine that doctors and surgeons use to sterilize their equipment. The Dry heat sterilizer completely kills any bacteria that could pose as a potential health threat. Includes Nail Shaping, cuticle treatment, a moisturizing hand massage with a finishing touch of polish of your or your child's choice. Soak your feet in a calming whirlpool, followed by gentle nail and cuticle work. Ending Process hot towel and lotion. Finished with the polish of your choice. Express mini version of a pedicure including a feet soak. Followed by a nail cutting, shaping with a nail and cuticle work only, along with a gentle exfoliation. (No heal work and lotion will be applied). Finished off with the color of your choice. A manicure enhanced with an Age Defying Treatment - hot towels, light exfoliate, antioxidant oils and paraffin treatment. Include a hot rock hand massage and deep moisturizing treatment. Paraffin is softens and relaxes the skin to improve circulation. The Deluxe Spa Pedicure rejuvenates the skin on your feet bringing a relaxing and clean sensation. After your feet are soaked, we apply a cleanser to clean the skin of its impurities. This is followed by a scrub that exfoliates dead skins cells to reveal a latent layer of shining skin. A calming mask is then applied on the feet to rejuvenate the skin. A hot stone massage is also included. Hot stone massages help relieve tightness in the muscles of the leg and improve circulation. The below are options for the pedicure. All of them contain healing properties. Pearl Spa: The Pearl Spa option focuses on skin nutrition to show a lasting, youthful look. The Pearl Powder used in the pedicure contains 18 different amino acids essential for bright, sprightly skin. Dead skins cells are replaced by new cells that help protect against harmful UV rays and slow down the aging process. Chamomile: The Chamomile option contains the most relaxing properties. The Chamomile used contains anti-oxidants that can greatly reduce anxiety and extend patience, relieving many of your worries. Chamomile also can fight against some bacteria and fungi on the skin and reduce pain from headaches, joints and places affected by arthritis. On Sen: The On Sen Pedicure detoxifies the skin and improves circulation. Ingredients come from volcanic areas that are rich in these detoxifying minerals. The minerals also give an overall pleasant feeling from relaxed muscles to a relaxed mind. Remove old polish and toenails are buffered and filed if needed for a neat look of desire with a new polish on.